SharePoint’s popularity has resulted in an explosion in the amount of content uploaded into it. Nearly all of that content is documents and other types of unstructured data stored as Binary Large Objects (BLOBs). Couple the growth in SharePoint content with an architecture designed for structured data and you can quickly encounter performance and reliability issues. So how do you ensure SharePoint performs well for your users while also meeting storage and budget requirements? 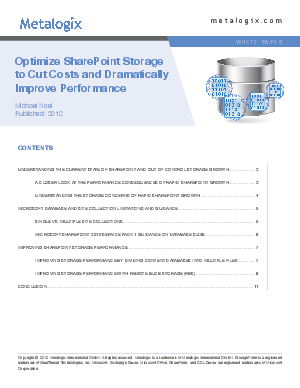 Read this paper to learn about Remote BLOB Storage (RBS) and other storage optimization strategies that increase SharePoint performance without increasing your storage costs.